Celebrate a marriage of convenience with these top ten wedding gadgets and gizmos. This novelty-wedding machine offers a 'quick hitch'. You get a couple of rings and a personalised certificate for a £1. 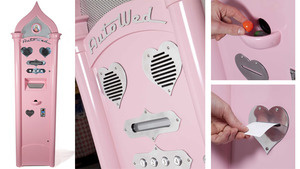 It's not legally binding but Concept Shed's Cadillac-pink retro machine complete with a small portrait of Jesus Christ makes wedding planning so much easier. "We came up with the idea last year and built the unit this spring specially for Marvin's Marvellous Mechanical Museum in Detroit, USA (marvin3m.com)," a Concept Shed spokesman said. Personalised Wedding Socks for the boys! A World Leader, for our precise purity & craftsmanship, benchmarked & unmatched against other competitors from around the world. Ref: The Frankfurt Lighting Expo April 2012. "Blastit4u, 79 Pinebrook, Trim. Gifts in Ireland"